And so, after much travail and some wailing and gnashing of teeth, BSI's staff mortician finally dropped the last shovel of dirt on the last shallow grave of the last worker to die building Lake Planco Park. This happened in a dark corner of the surrounding woods simultaneous with Mayor of Lake Planco ceremonially cutting the ribbon and letting in the 1st herd of customers at the front gate. BSI thus cashed its check and left the country. As Bullethead liked to paraphrase Heinlein, "when the private jet is over the horizon, all bills are paid." The most important new thing built this go-round was the main backstage area. This is on the ice rink parcel adjacent to and accessed from the gorge highway. 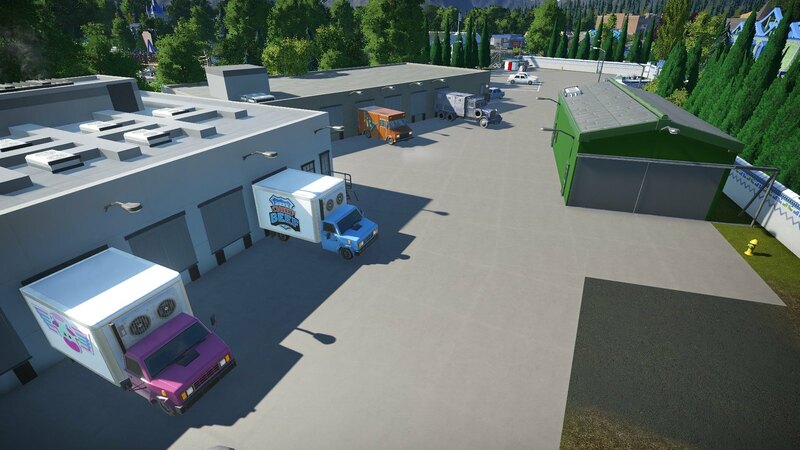 It consists of employee parking for office staff, warehouse managers, and employees-of-the-month, a dry storage warehouse, a cold storage warehouse, and a repair shop for park vehicles and equipment. Also, it's the collection point for the park's garbage. 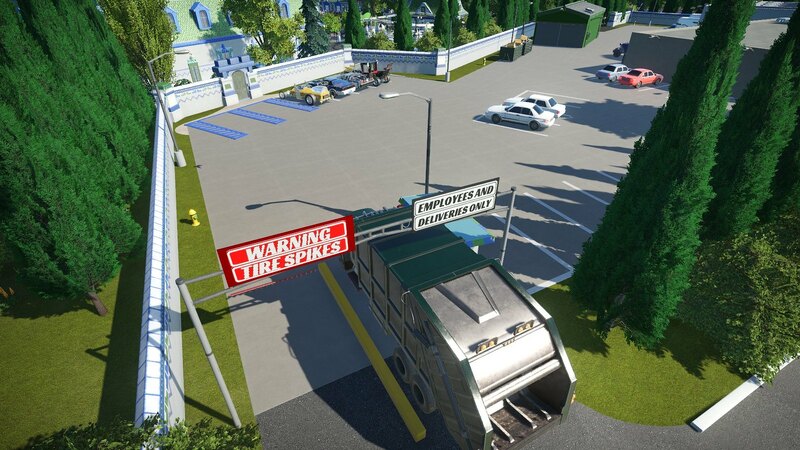 It connects to the tramway so service vehicles (and trams in a pinch) can carry supplies to and garbage from the park. Here's a close-up of the main buildings in the backstage. In the foreground is the cold warehouse with frozen food being delivered. In the left background is the dry warehouse, also with deliveries (such as hats and snowglobes) in progress. To the right is the mechanics' shop. Fire hydrants surround this area and all buildings have the necessary emergency exits. And here's the access to the backstage from the gorge highway, well-guarded to keep out the unauthorized. In the parking slots next to the main park offices, you can see my own car, Dragula (assigned to me by JP). Next to it from left to right are the cars of JP and Rug (on-site as a last-minute consultants) and RubleTrilliions (to make sure his midway games were working). Entering is the garbage truck ready to sweep this park to the dustbin of history. The other non-required major construction project was the Ice Rink Marketplace to finish off the main plaza. This was originally just a foundation with volleyball and badminton courts on top. Now it's a food and gift emporium, plus houses the park's EMS squad. And here's how the Jenkins' Farm parcel SHOULD have looked last time, all fleshed out. Off the main paths, the gardening is a bit sparce as the ground required mucho rehab from generations of scrub farming. It will eventually become reforested to match the surroundings but it's early days as yet so there are some saplings and weeds for the most part. 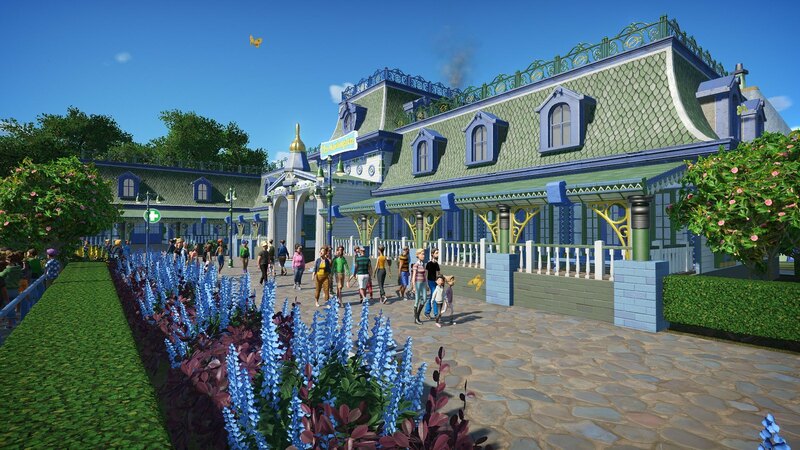 RubleTrillions' midway games have been dragged, kicking and screaming, into the trademark "Steampunk Atlantis" architectural them of the park, and the various rides on the farm have also gotten some sort of skin. The midway is subject to being blasted by an antique band organ. As with most such devices, it looks disturbingly like the ferocious Mesoamerican storm god Tlaloc, so has been put on an altar-like base suitable for human sacrifices. 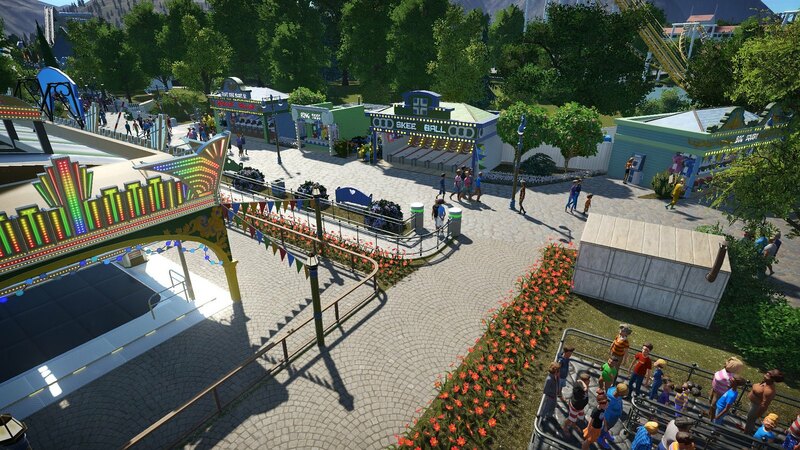 The old-school looping coaster in the farm parcel, Cool Breeze, has been pimped out. The queue is mostly awnings, the station is mostly tarps. The central pond will eventually be ringed by lilies but so far they haven't spread from the initial plantings. And the mighty Pythagoras Racer has been pimped as well, including a sign showing the 3-4-5 right triangle embodying his namesake theorem. The bifurcated roof of the queue allows those waiting to watch the races going by over their heads. What happened to Farmer Jenkins? Well, he cannily waited until property values peaked before selling most of his land for a very tidy sum. Then he fixed up his house and barn. Then he turned his pappy's old car, which had been abandoned in a back corner of the barn all his life, into a hotrod ZZ Top would be proud of. And then, to keep himself busy in his retirement, he got into butterfly ranching, breeding them by the thousand in his refurbished barn. And he bought a minivan to haul them around., He has a very lucrative contract with Lake Planco Park to keep the place full of butterflies, plus sells to other customers, and gives tours of his establishment. 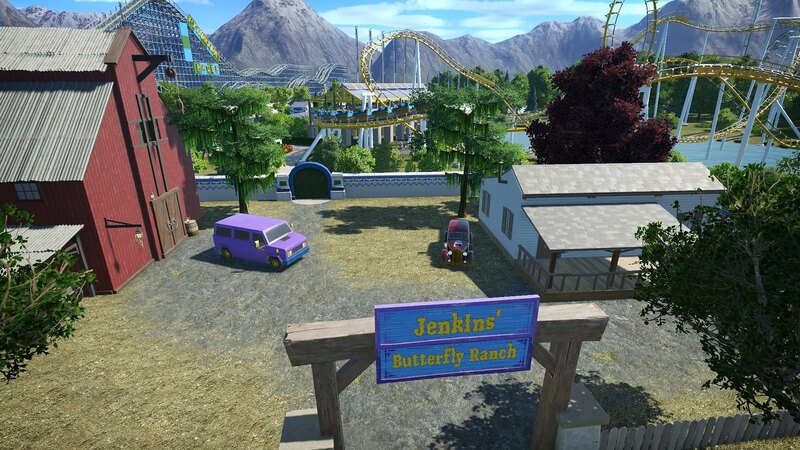 RANCHER Jenkins (only beekeepers run more head of livestock than he does) is doing so well, in fact, that he sponsored a new flat ride in previously vacant corner of the "Clifftop" area, overlooking the gorge highway beside the impressive tram bridge. It's called "Butterflies". The butterflies are thicker there than elsewhere in the park as yet, but it's still early days so they haven't yet attained plague status. So that's it for Lake Planco Park, except for the coaster POVs. I've got the raw recordings but haven't edited them yet. Hope you enjoyed. Well done. Thanks for giving me a place to park, although I noticed the Bulletmobile is missing it's top hat. I love how much the farmer worked his way into everyone's stories. Butterflies is a very happy ending. But since you seem to have killed off half of your own staff, I do feel that proper balance has been restored. As I told you earlier, I'll never build a Galaxi again now that I've ridden yours. Between the track layout and the perfect custom supports, I simply refuse to invest the time in something that I haven't gotten right in 5 attempts. Likewise, the racer was impressive as well, even moreso now that I know you did all the custom support work on it. I really smiled seeing the original hockey markings on the ice rink, and I think my eyes flew out of my head when I saw what you did with the dripping stalagtites in the cave. Those, and the backstage areas were all pleasant surprises for me since I toured the park before you posted your thread. But now that you have posted the thread, I'll be needing to go back to the park because I missed a few things, and I also haven't rode the rapids ride yet. It blew off in the haste to get here for the opening ceremony . I take pains not to kill off my staff. Such dubious characters with the right personalities are hard to find. Now, the general laborers are all expendable, of course, and that's who takes all the casualties. But they're generally unwanted at home and unwelcome abroad so it's a win-win . I'm greatly flattered you like my Galaxi. Mine's far from perfect but it's close enough to trot out in public. As to the racer, there are about 600 pieces of custom supports but they just fill in the gaps between the lower and upper levels. The tracks don't quite line up so the upper level was floating through both hairpins in various places. The original coaster this was inspired by had heavy timber supports quite unlike the toothpicks provided by the stock supports. Like telephone poles braced with 18" planks. 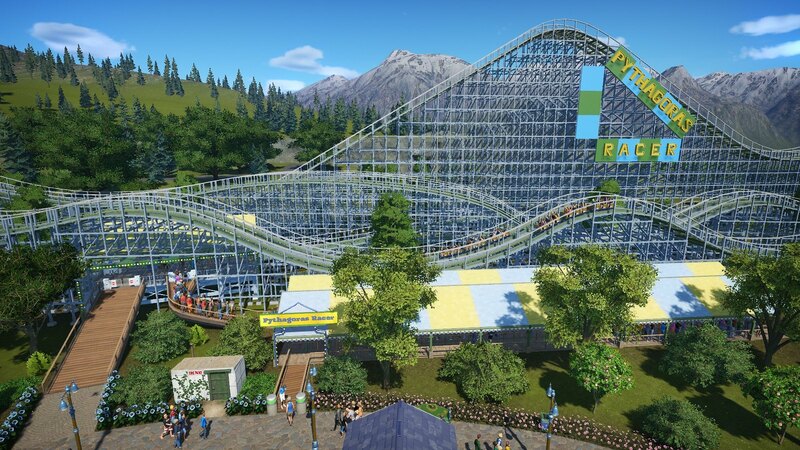 So one of these days, I might totally custom-support this thing to make it look more like the original, but my attempts so far have made it look more like a steel coaster. Knowing what the original looked like, this doesn't bother me, but it might raise eyebrows. Thank you very much! Credit for the hockey markings goes first to Salad Fries for making the ice rink regulation size, then to Frontier for making the curved wall sections on the same radius as the real faceoff circles . When you ride the rapids, I recommend seat #8. I think. Better go back to that thread and make sure, as I know I mentioned it there . Anyway, thanks for your comments and appreciation. I'll be looking at Jeronimo shortly. Bullethead got a lot of good things to say about your entry! I love the unique architectural style especially how consistent it is. I particularly like the totems on fire drop and most of the ceilings in a lot of walkways like the entrance. I like how you have put contingencies and things like water pumps, emergency exits and backstage delivery areas. Very well thought out, though everything you do is carefully considered in this game. Anyways, there is a lot to love here! Thanks muchos! I like to create my own architectural style sometimes but, as I have no imagination or even taste, I just throw stuff together. I like the results but often nobody else does. Glad to have finally come up with something others like . BTW, while I think ornate ceilings are required for this particular style, I seriously don't recommend them for contest parks. They take a lot of time and you can't really show them off given the limited number of screenshots each round. Next time, no interiors unless required! Thanks again! This was my 1st attempt at adding such features. 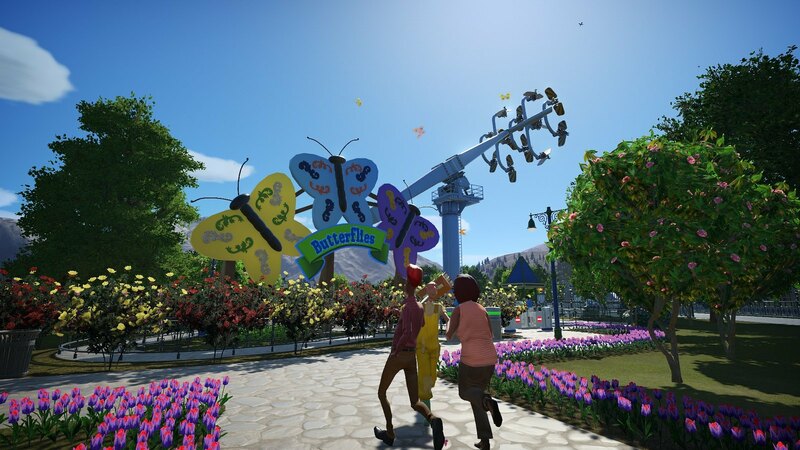 Normally I don't bother because my head cannon is that Planet Coaster literally is another planet (as you can tell by the celestial motions), so peeps are all space aliens and the whole park is probably all VR anyway. But when we had to make a parking lot from the get-go, I figured I'd have to do all the other realism stuff, too. Glad you think so. I'm kinda the same way, actually. I'm so impressed what you've put together in such a short time and under pressure of the challenges. The layout of the park is amazing, the gardening very colorful, the architecture great looking and the coloring of the buildings and design so unique. Cool breeze looks a little like a bit of a neck breaker, but I did nothing else expect from an arrow / vekoma type coaster... Further the compact coaster looks just perfect! And that you have done a racer is really cool! 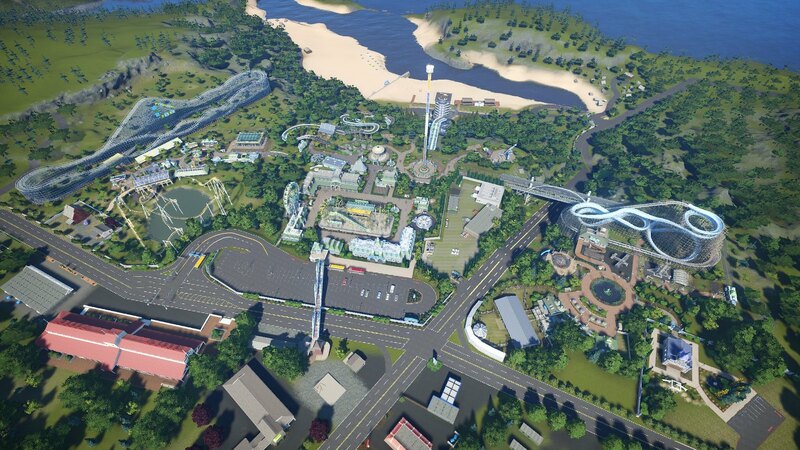 But the genuine strike is always that you manage to accompaign your parks and designs with a unique story which is always so much fun to read and entertaining. Thanks for building and sharing. Can't wait to see what you build next. I'm so impressed what you've put together in such a short time and under pressure of the challenges. The layout of the park is amazing, the gardening very colorful, the architecture great looking and the coloring of the buildings and design so unique. Thanks for the kind words, CorkscrewLoop! You're one of my heroes so it means a lot . Cool Breeze looks scarier than it really is. The G forces are actually quite low because it's so slow, using its mass for momentum instead of speed. Nice and gentle, hence the name. It's really just a kiddie coaster that loops . 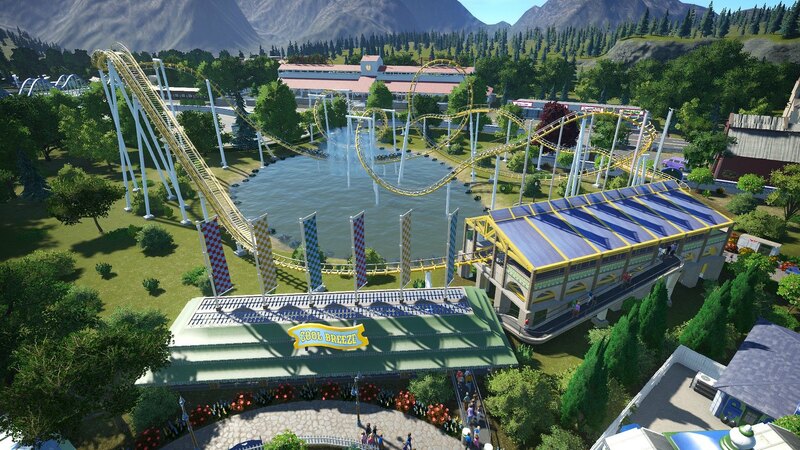 Further the compact coaster looks just perfect! And that you have done a racer is really cool! 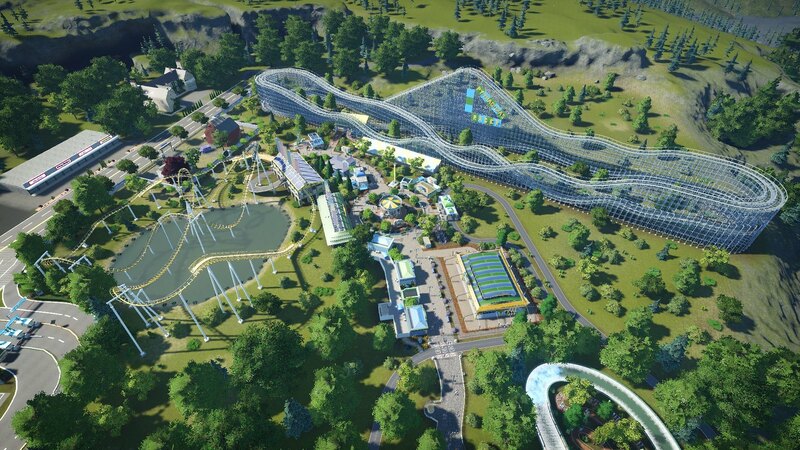 But the genuine strike is always that you manage to accompaign your parks and designs with a unique story which is always so much fun to read and entertaining. Thanks for building and sharing. Can't wait to see what you build next. Thanks again!. I'm rather proud of both the Galaxi and racer. They were both a lot of work, although I built them both before the contest. However, I did do a lot of extra work on them for the contest. I put more bank on the Galaxi track and had to redo all the supports, and I added a bunch of gap-fillers to the racer. Very glad you liked my park. Thanks again. The pics and vids are fantastic! Where's the link to the park so I can explore this in game? Thanks for your interest and compliments. Also, a caveat. The racing coaster will only function properly with real live peeps in the park, so you'll have to open the park and at least that 1 coaster. Then, the queue has to get full enough that there's a steady flow onto the coaster, and then it has to run 5 or 6 trains through the station to get all synced up. Just looked at this park in game! WOW! Really wonderful things happening. Love the hotel by the beach with the spiral tram thingy....very cool solution to the bridge problem. Cloud Dancer was fun and the station is beautiful. My only critique, and I understand why you did it, but my personal aesthetic....would have liked a little more color variation in the buildings.....lots of blue and green going on...though perhaps that is part of the back story and I was too daft to realize that. At any rate, this park is wonderful and that wedding chapel.........yum! Thank you very much, Lux! It means a lot coming from a master such as yourself! I agree, this park over-uses blue and green. I'm definitely NOT using those colors much if at all for the next little while as I'm rather tired of them myself . The reason here, though, was to try to make the park blend in with its surrounding forest and lake as much as possible and keeping the idea of the "lake" in Lake Planco always in folks' minds. Also, I decided they were the main colors (along with yellow) of the local high school and the local politicians wanted to emphasize that., so it was sort of a concession to outside pressure . Glad you like the hotel. That thing was a total pain to make, especially putting railings on the tram spiral. I thought it was a cool idea until I got into and ran into all the problems, but by then it was too late to come up with an easier plan due to the round deadline I like the Cloud Dancer station myself, at least on the outside, although the judges didn't . 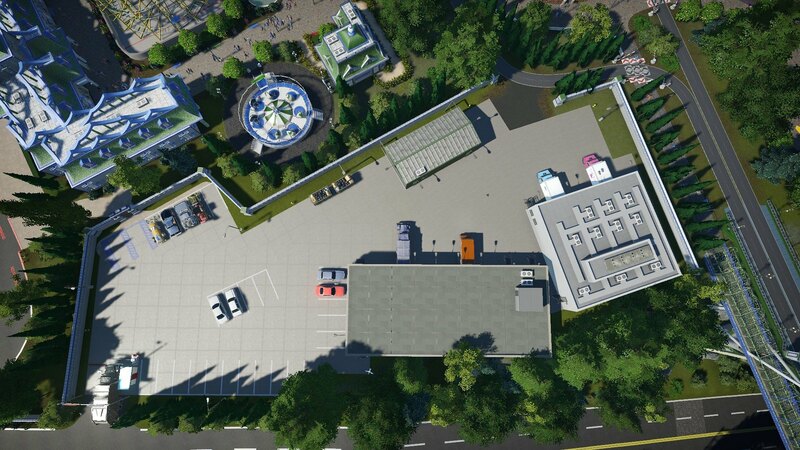 The inside is a bit drab compared to most in the park but it's supposed to be a utilitarian airport terminal so I didn't spend a lot of time on it. But I think that chapel is my favorite thing, too. I find it a wonderful park Bullethead, well done! Only had the time to view your first POV (the water ride). The cave area of your ride reminds me of how i would have liked to create the underground area in my park, filled with colourful crystals or hidden spots of unspoiled treasures. You have certainly given me ideas. Question: going up the lift hill goes rather fast or is that my imagination? Forgath, when you get time I highly recommend taking a walk around this park. The photos don't even come close to how awesome it is. From the ceiling design to the cohesion. Highly recommended the tour. I intend on taking the tour. 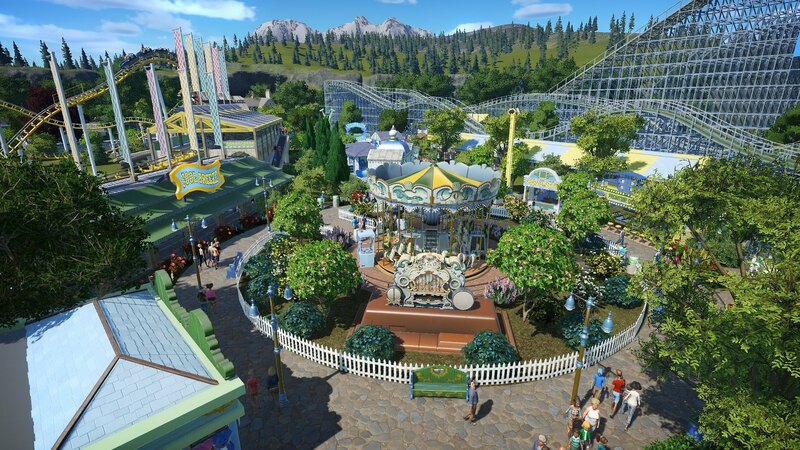 However, its the same with me being able to spend time / build my own park (for the contest), i have time once a week at the moment. I am aiming to visit this park (and the other ones) this sunday. @Forgath: Thanks for the compliments! I noted the crystals on your water ride and hope to see all that fleshed out someday. My cave is more mundane, just some rocks and dripping water, but I put some fireflies and glowing drips in it, too. And yes, the lift goes fast. I always increase the lift speed to max on all my rides. I originally got into this habit because when PC first came out, the game included the lift in its calculations for the ride's overall excitement rating, so having a slow lift really killed a ride's stats. Even though this calculation now ignores lifts, I still keep the speed high because it helps in other ways. First, the train goes into the 1st drop at a higher starting speed, so maintains a higher speed all through the track than it would with a slow lift. This increases overall excitement throughout the ride. Also, it means the track can be a little bit longer before the train totally runs out of juice, which increases the duration. Both excitement and duration go into prestige, which is the main thing that peeps consider when deciding which ride to go on. It's often the first thing I do to keep the ride speed up. I upped the chain speed on the woody in step rock park for e.g. What a great park. The backstage area is fab and just adds to the overall awesomeness of it all. And of course, an entertaining, funny commentary. Thanks muchos, bro! Means a lot. So, when will you be available for another all-night drinking bout?